McDowell played superbly and finished with a 3 under par 68, two shots clear of a chasing pack which includes Phil Mickelson. 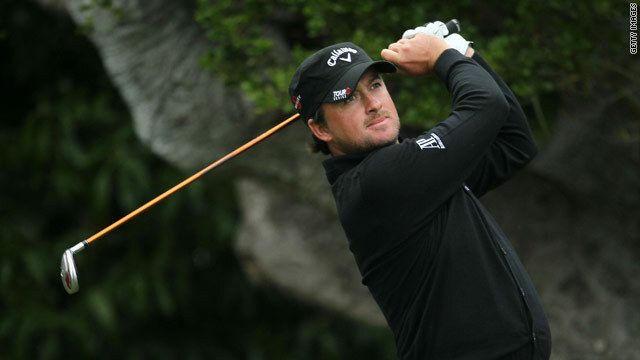 (CNN) -- Northern Ireland's Graeme McDowell scored a 3 under par 68 in the second round to lead at the halfway point in the 110th U.S. Open at Pebble Beach in California. Starting on the 10th tee, McDowell began and finished his round with bogies, but in between managed to make six birdies, including four in his opening nine holes. McDowell, who recently won the Wales Open at The Celtic Manor course -- which hosts the 2010 Ryder Cup in October -- has a two round total of 139, two shots clear of a chasing pack which includes Phil Mickelson and South African Ernie Els. Mickelson surged back into contention on Friday with a 5 under par 66, repairing the damage of his opening round 75. Mickelson -- bidding for his first U.S. Open victory -- made a blistering start to his second round with three successive birdies at the 2nd, 3rd and 4th holes. Despite a bogey at the 9th, Mickelson arrived at the turn in 31 strokes, 4 under for the round. A faultless second nine, which included a birdie at the 11th, saw the three times Masters champion home in 66. "I thought something in the 60s was out there and would get me into contention," Mickelson said, according to the Associated Press. "I knew I needed to get off to a quick start because the birdie holes are the first seven." Els's, who hasn't won a major championship since the 2002 British Open at Muirfield, enjoyed a welcome return to form with a second round 68. Britain's Paul Casey and Ian Poulter both finished two over par for the day with scores of 73. But both men remain in contention. Casey is in a tie for sixth place on even par, while Poulter is one shot further back in a tie for 10th place with South Korean, K.J. Choi and Dane, Soren Kjeldsen. Lee Westwood, winner of the St Jude Classic in Memphis last week, is a further two shots back on 3 over par after scoring 71, an improvement on his opening round of 74. The Republic of Ireland's Padraig Harrington and Englishman Luke Donald are currently on 4 over after two rounds and tied for 25th place with Tiger Woods. The world number one had a mixed day carding a one over par 72 to go with his disappointing opening round of 74, leaving him seven shots adrift of leader, McDowell. Woods refused to concede he was out of the tournament despite having never won a major from more than six shots behind going into the weekend. "I'm right there in the championship," Woods said, reported the Associated Press. "I just need to make a few more birdies, a few more putts on the weekend, and I'll be right there." McDowell is bidding to become the first European winner of the U.S. Open since Tony Jacklin won at Hazeltine National Golf Club 40 years ago. "I'd be lying if I hadn't thought about picking up the trophy on Sunday afternoon," McDowell said, according to the Associated Press. "But I'm trying to be very realistic about it. I'm not seeing the battle as being with the rest of the field. I'm seeing the battle with myself and the golf course," he added.